Head Instructor Sensei Steven Scott 3rd Dan. 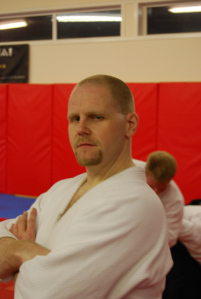 Sensei Steven Scott was born in Kilwinning, in Ayrshire, and began his martial arts journey and training in 1980 when he started to study Judo at age 8. After four years he eventually moved away from Judo practice to begin training in Shukokai Karate at a local club from 1984 until 1998. During this period he attained the rank of 1st Dan Karate in 1992 and 2nd Dan Karate in 1995 and both taught and trained within his local area until 1998 where he finally left his Karate days aside to focus on his practice of Aikido, and to begin teaching this art to a new generation of students. It was in 1992 that Sensei Scott first stepped onto the training mat in an Aikido Dojo and was immediately dedicated by the principles, philosophy, and complexity of the art. He studied Aikido diligently, eventually attaining the rank of 1st Dan in 1998, 2nd Dan in 2001, and 3rd Dan in 2007 under the watchful eyes of the late Sensei Hayden Foster of The Hut dojo in London and the Institute of Aikido. Sensei Scott opened his first Aikido club in 1998 in Kilmarnock, Ayrshire, and has remained teaching and training in the art ever since.